NOTE: This Dover edition, first published in 1972, is an unabridged and unaltered republication of the work originally published in 1941 by A. S. Barnes and Company, Inc., under the title Backgammon. COVER: If you have a board, markers and two dice, you, with this book, will soon be playing a game that is becoming more and more popular today. For those who have never before attempted to play backgammon, Hopper presents the basic rules of the game complete with gambling conventions and rules for the popular off-shoot acey-deucey. Through a wealth of diagram, remarkably clear explanations, and a sample game with play-by-play analysis of moves and strategy, he makes the game simple enough for anyone to play. For the more advanced, he gives the best opening and ending moves as well as the three basic strategies of moddle game playthe running game, the blocking game, and the back game. Since the game does depend somewhat on luck, he also intriduces the reader to the concept of chance with tables of odds for all possible rolls of the dice. There are even backgammon problems for the reader to solve. 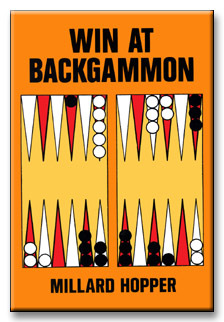 If you have always wondered how to play this ancient game of chance and skill, or if you have already been bitten by the backgammon bug, Millard Hopper, the Unrestricted Checker Champion of the World and the most profound writer on that game (Win at Checkers Dover 20363-8), will answer all your questions about backgammon and increase your pleasure and skill through his championship secrets of play.